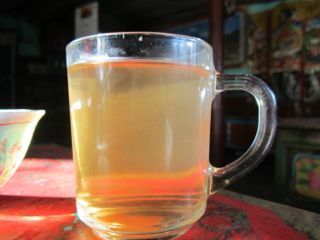 Tea, otherwise known as chia in Nepalese, is the national drink in Nepal. 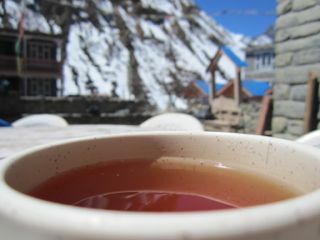 Nepal is a tea heaven. It is available everywhere, 24/7 and for not even 10 cents a cup on the street you can have as much of it as you can handle. The quality of the tea leaves is not the best in the world, but the key to this delicious drink is all in the preparation and the other ingredients (especially for their spiced tea). Most of the tea available in Nepal is a black tea - white or green are extremely hard to find and once you find it, it's probably in a teabag (clearly inferior to good ol' loose leaf!). The black tea variations consist of black tea, milk tea, or dud chia, and spiced tea, or masala chia. Chia means tea in Nepali and, confusingly enough, Chai is tea in Hindi. 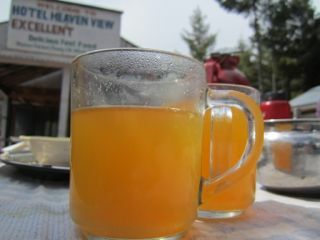 The other varieties are mostly herbal and consist of ginger tea, lemon tea, honey ginger lemon tea, jasmine or mint tea. 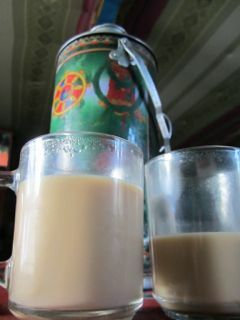 The tibetan variety, butter tea, was left untouched. I had it once or twice when I was in Tibet in 2008 and it was enough to last a lifetime. 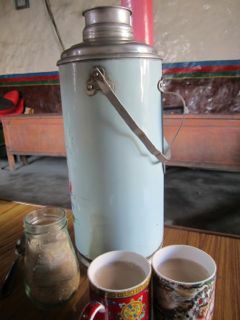 Butter tea is literally hot piping butter (usually from yak or cow) and it feels like drinking a soupy chapstick. No thanks!! 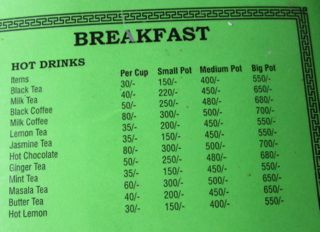 In most places, tea is very cheap and it's fun to drink - at some points I swear we were having 10 cups of tea a day. If you've ever had 'chai' tea or spiced tea, Indian style, that's exactly what masala chia is. Funny thing is, for a westerner, 'chai' is a kind of tea just like a 'latte' is a kind of tea, but in Hindi, 'chai' just means tea. 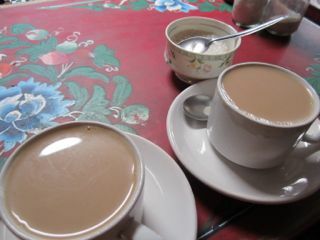 When getting a "chai tea", it's the same as just ordering a "tea tea." 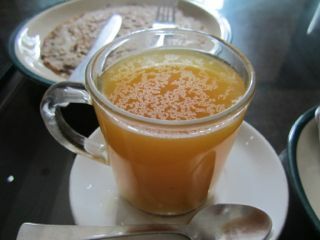 Masala chia, meaning spiced tea, was my favorite kind of tea in Nepal. Fresh spices such as ginger, pepper, cinnamon and cardamom are ground and added to black tea with milk (strained before serving). 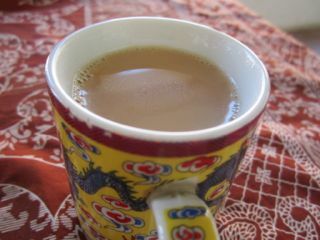 As with any black tea, whole milk is used. We usually asked for our masala chia without sugar because the Nepalese way was a bit too sweet for our tastebuds but sometimes, especially during our long trek, we welcomed the extra sweetness. 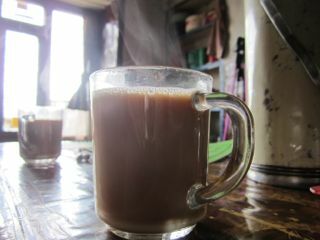 A very close second to masala chia, this milk tea is just black tea with whole milk and a little (or a lot) of sugar. It's great for the mornings or during a tea break in the afternoon. We didn't always get it loose leaf though, some of our destinations were too remote and we had to resort to the teabag. 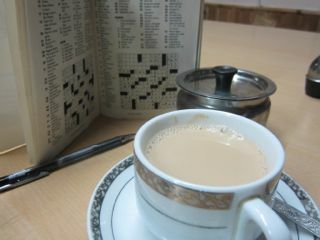 Tea and crosswords, what else could you ask for! This was just hot water and black tea, nothing to write home about but very handy once your stomach starts giving you problems. Milk is not always ideal to have, especially when sick so black tea was a good alternative and it also helped us with some headaches (in lieu of coffee). Real lemon on my HGLT! My favorite, by far, of the 'herbals' offered in Nepal. This tea is great for a sore throat or a cold. The unfortunate part is that the 'lemon' is not natural, it comes from a powder, and the herbal tea was almost always in a teabag. Regardless, the nice hot mixture of honey, ginger (real ginger! 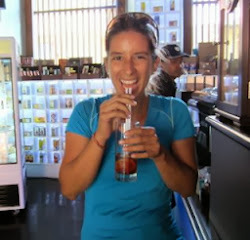 ), lemon and tea was a life-saver plenty of times. Hot water plus freshly shaved ginger is another good one if you're sick. Sometimes they didn't have HGLT so the plain ginger tea was a good enough alternative. Mint grows everywhere and it was a good night-time beverage. All they did was add fresh mint to boiling hot water. Usually we'd down a giant thermos of mint tea prior to dinner, just to keep warm. 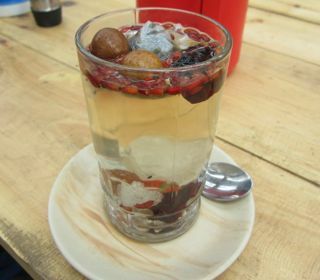 This was just jasmine tea in a teabag. Got it once or twice, and the 'jasmine' taste wasn't really there. 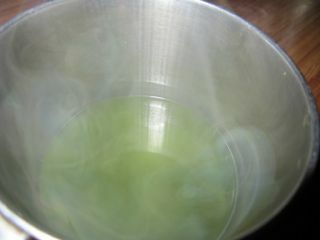 Green tea! I only really had it once. It was on ABC and it was given to me as a present by a Japanese trekker. He brought small packets of matcha (green tea powder) from Japan and even though it was 'inferior' to the real deal, it was so good sipping on my favorite kind of tea!